His Highness the Emir Sheikh Tamim bin Hamad al-Thani and Ukraine President Petro Poroshenko hold talks at the Emiri Diwan on Tuesday. 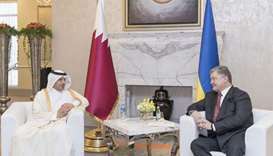 His Highness the Emir Sheikh Tamim bin Hamad al-Thani held official talks with President of the Republic of Ukraine Petro Poroshenko at the Emiri Diwan on Tuesday. 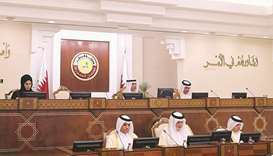 At the beginning of the meeting, the Emir welcomed the Ukrainian President and his accompanying delegation, noting that the visit would strengthen co-operation between the two countries in various fields. Poroshenko praised the strong bilateral relations and stressed that he was looking forward to further developing them, especially in areas of interest to both countries. 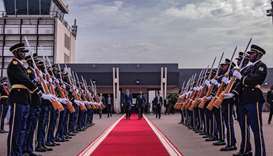 During the official talks, they discussed how to strengthen co-operation between the two countries, particularly in economy, trade, energy and agriculture. They also discussed the most important regional and international issues. 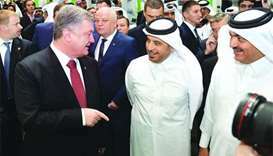 Later, the Emir and Poroshenko witnessed the signing of agreements on mutual exemption of visa requirements, technical military co-operation, the establishment of a joint economic and technical co-operation committee, promotion and protection of mutual investments, avoidance of double taxation and prevention of fiscal evasion with respect to taxes on income, and a memorandum of understanding between Qatar University and Taras Shevchenko National University of Kyiv. 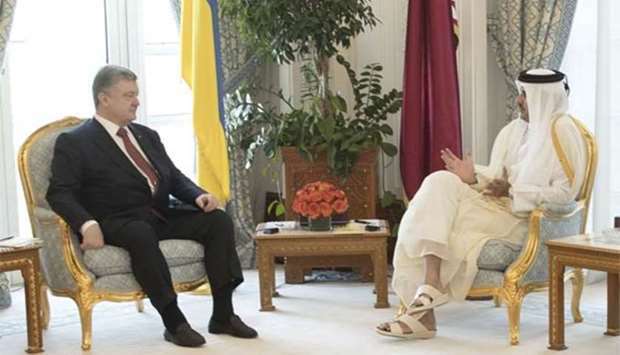 A number of Qatari ministers and members of the official delegation accompanying the Ukrainian president attended the talks and signing ceremony. The Emir hosted at the Emiri Diwan a luncheon banquet in honour of Poroshenko and his accompanying delegation. 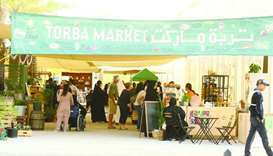 It was attended by Qatari ministers and Poroshenko's delegation. 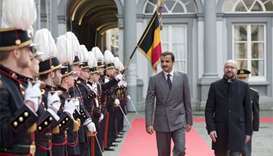 The Ukrainian leader was accorded an official reception ceremony on his arrival at the Emiri Diwan. Poroshenko left Doha in the evening. 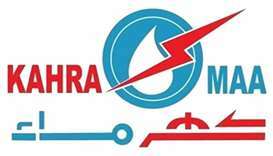 He was seen off at Hamad International Airport by HE the Minister of Energy and Industry Dr Mohamed bin Saleh al-Sada, acting charge d'affaires at the Qatari Embassy in Ukraine Aisha Mohamed Ishaq al-Ghaffari and Ukrainian ambassador to Qatar Yevhen Mykytenko.